Birthday celebrations are often the source of very special memories and wonderful photos. 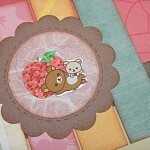 And, they are a great subject for your scrapbooking layouts. 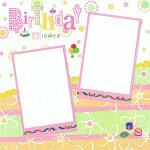 Today’s layout shows you how to take a simple sheet of birthday stickers and create a beautiful page for your precious birthday memories. Yesterday we celebrated my Dad’s birthday. We had a wonderful family day with yummy food (I made a salmon quiche) and good company. And, of course, for the occasion, I made my Dad a cute birthday card. 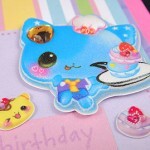 Super puffy stickers from kawaii brands like Kamio are perfect for adding that extra special touch to your handmade cards. 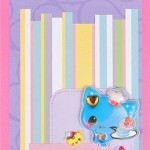 They are not only amazingly cute, they also give amazing dimension to your cards and really make them pop. Some of them are even decorated with rhinestones! 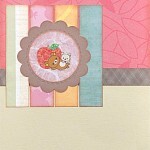 Last week I introduced you to the adorable Japanese bear, Rilakkuma, so today I thought I would share a cute card I made using some of our new Rilakkuma stickers. I hope you like it! 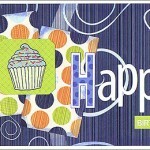 Creating handmade tags are a great way to dress up both your birthday girl stickers and your scrapbooking page. 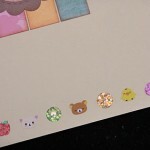 In this double-page layout we look at how to effectively combine using stickers directly on your page with dressing up your stickers with tags. Our new range of Paper House stickers are the perfect sized embellishment for creating beautiful and one-of-a-kind handmade cards for your friends and family. And their realistic appearance makes them extra special. If you’re like me, you have mountains of birthday photos and are always looking for new birthday scrapbooking ideas. I love to see how far I can stretch my supplies so this week I challenged myself to create three unique cards from just one piece of scrapbooking paper. 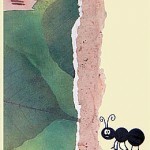 Apart from the one paper, I only allowed myself to use cardstock, stamps and pens – nothing else. Here’s what I came up with! 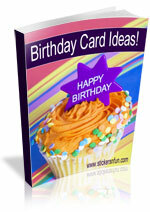 Subscribe for your free email newsletter full of great scrapbooking ideas and your FREE Birthday Card Making Ideas eBook.